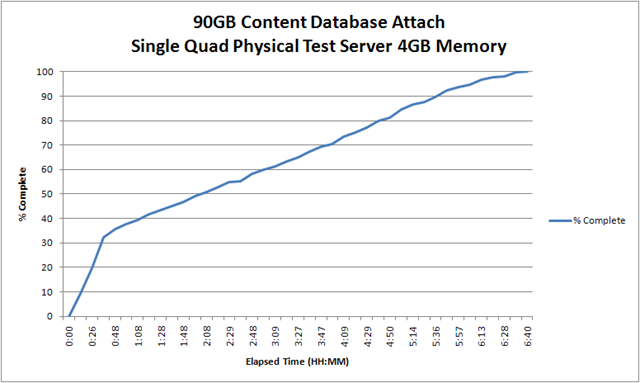 How Long Does It Take To Attach a 90 Gigabyte Content Database in SharePoint 2010? | Are you a user? How Long Does It Take To Attach a 90 Gigabyte Content Database in SharePoint 2010? Thought this might be an interesting graph for some folks. This shows the elapsed time for upgrading a content database using the database attach method. This was all done on a memory-starved, physical quad-core server with 4GB of memory that has SQL, SharePoint 2010 and Project Server 2010 on it. This is NOT a final production configuration…it is merely a test to see what issues we are going to encounter during the upgrade to 2010. Now we have to wade through the "not best practice" UI customizations that were done to our 2007 web apps. Looks like it’s time for an extreme makeover!